Open up a 1 tick chart and insert the pvp indicator on it ('DBPVP'). Then you can minimize. For some reason...in the code you will see two places where there is "minmove/pricescale" depending on how your computer sees minmove...you will need to have just minmove or minmove/pricescale. So if it is not working properly it will need to be just minmove...haven't figured out why that is...we are still in beta testing but hopefully it works for you. Let me say thank you to BAMBOO's ADE that I used for Tradestation. It is fantastic! Thanks to everyone here on this board for their sharing and help. Hopefully this can be of use to some of you. Again I am only posting as I can't keep up with all of the emails. Also, this is what I used for myself on NQ and ES. Use at your own risk. Also, you can add as many SD bands as you want. Inside the VWAP indicator you just add another plot statement just copy the 2SD plot and change the multiplier from 2 to 3. I saw someone wanted the 3SD as well. Please if someone else can assist other members with their questions I would greatly appreciate it...I just don't have the time right now. Thanks in advance. Good luck to all and your trading. I won't be able to answer any questions as I can't even remember what I was doing...I apologize in advance...it has been about 6 months. Thank you dbntina for your kind contribution. Those installing this for the first time will likely also need ELCollections by Bamboo. 1. Unzip the zip file into a directory. 2. Copy the ELCollections.dll file to your TradeStation program directory (e.g. C: \Program Files\TradeStation 8.0 (Build xxxx)\Program). 3. Import the ELCollections.ELD file into TradeStation. 4. Install the library in your brain. In other words, read the documentation! This is a big library, so studying the documentation will save you a lot of time and effort in the long run. 1.01: Read very long lines from text file. Improve performance with string keys (works around TS issue). 1.02: Many new functions. See post below for details. 1.03: Updated to support ADE with TypeZero bars. 1.04: Fixed issue with ADE TypeZero data files. 1.05: Fixed ListN.InsertSorted so that it always returns the correct value. You can check what version you have by opening the ELC_Version.txt file from the ELCollections.zip file. If you don't have that file, you don't have the latest version. ELCollections is in the public domain and may be freely used and distributed. The ELCollections software is offered "as-is", with no warranty, either express or implied, of its suitability for any purpose. My limited understanding of PVP is that it is the Peak Volume Price or the closing price at which the current peak volume (highest volume of the day) had traded; however, apparently the PVP calculation is more complicated than that. thrunner...thanks for your post. I don't believe they will need to install ADE. When the indicator was created it included all of the ADE information needed to run the indicator. It appears the people that I had been sending it to did not need to install ADE either. HOWEVER I could be wrong. Thank you for posting the information just in case it is needed. I appreciate you including that. does the PVP indicator work on historical charts --- or does it need to be collecting data in the 1-tick chart in order to calculate PVP? (and therefore only works on a go-forward basis if that 'data-collection 1-tick chart' is left open)? no ...pvp must be collected live. Don't refresh the window either or I think you might lose the data as well if I am remembering correctly. 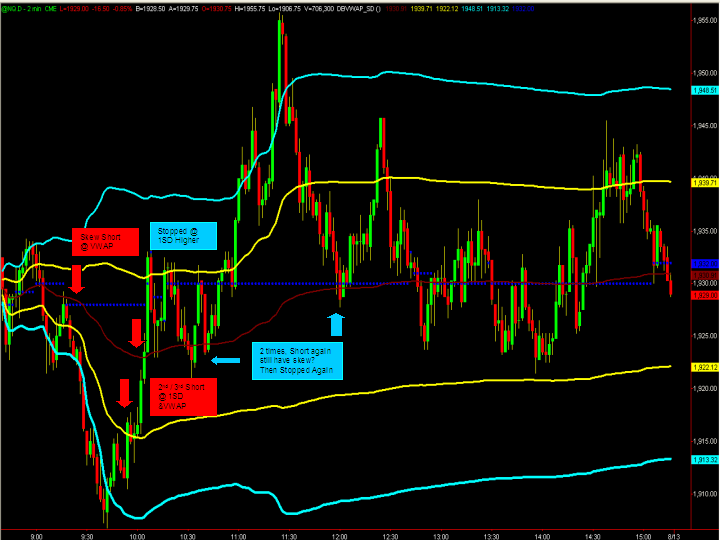 Everything else can work historically (VWAP and SD bands). one other thing just so I know. forget VWAP/SD for this question. just pretend I want to watch PVP only. if I have my 1-tick window minimized and my 2-minute chart is up running PVP --- how does the pvp calculation in a 2-min chart know to pick up the data from the 1-tick chart and not vice versa (that is, why doesn't the 2-min data feed into the 1-tick chart if both are open and running the same indicator)? That is the awesome thing about what BAMBOO on the tradestation forums created. He is an awesome programmer and he created a programming addon that allows ts programmers to do some really cool stuff. One of those is to be able to pass variables stored in one chart to another chart in a different timeframe. That is how it is done. 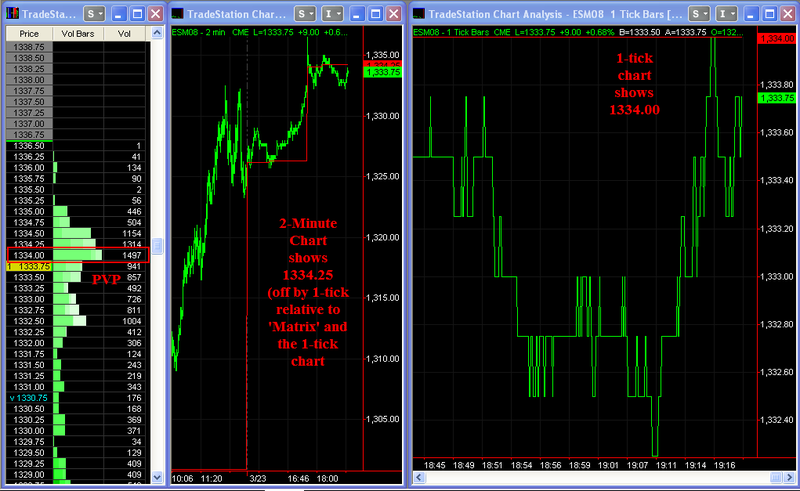 The information updated on a 1 tick chart is passed to the 2 minute chart for example and plotted realtime. Basically it is all in how you call the variables. I am calling the variable from the tick chart. You have to understand BAMBOOS ADE to be able to do it properly because technically you could do it in reverse like you said. It is fantastic. Thanks Bamboo!! I just loaded this up an hour or so ago and right now my 1-tick chart shows the correct PVP (it matches the highest volume bar that is in my 'Matrix' window) --- while my 2-minute chart is slightly off. I assume that in the future, there won't be this discrepancy (once it has collected the data). I trust that the code is working --- but the 2-minute chart is not right now feeding off the 1-tick chart. is there a rule that you know of where the 2-minute 'catches up' to the 1-tick chart? would be useful to know when the code begins to 'kick-in' and draw off the 1-tick chart. Nice to see you back (even for a fleeting visit). Congratulations on the new addition to the family and the new job. Thank you dbntina for the indicator. Thanks Blowfish...hope everything is going well for you man! Can this be used with the YM? If so, What would be the best settings to use for the arrays? 750/375? Hi I am a new user in TS and I have downloaded the vwap and pvp from here. Thz for writing up the codes dbntina, but I had some problem applying the pvp in my chart, as it is always off from the matrix when I compare both. I was trying to use this in the stocks and I am wondering if I have to adjust anything to fit the indicator into the stock chart. i look the works of dbtina and is amazing. Now i'am searching any upgrade or improvmente or new version of the code. Are there any upgrade? Did you find useful dbntina's indicators? Yes i am building a trading method. So, did you modify dbntina's indicators adding new code? I'm interested in the same method but I can't find newer or updated volume indicators such as pvp or vwap. Do you have (or someone has) any of these? I am at the beginning and understanding how the code works. At the moment i don't have built new code, i am only take point how could i built a trading metos use this indicator. If i built something i post, and condivide. Shouldn't the cumulative volume be relevant to the volume total? each run through you are accumulating the total volume with. I don't believe the original formula attributed variance to the individual independent elements as a 'whole'. If you use /ShareW you are not evaluating an individual independent element. You are evaluating a summation of the individual independent element. NOTE: I forgot to mention that I'm using the CLOSE and not the avgPrice. That's what is called for i believe. The price of the element is divided by the volume of the whole sample. This means that every time a new element arrives (bar) you need to re weight every single element in the sample with the new total volume of the sample.